Can You Join If You Have Been Arrested? If you need a waiver, that means you are ineligible to join the military. The waiver is the process of you asking the service to make an exception in your particular case. The recruiter is the first step. Only a military recruiter can initiate a moral waiver request. Keep in mind this is the recruiter's decision, not yours. There is no right to have a moral waiver processed. If the recruiter doesn't think there is a good chance of approval, he/she doesn't have to waste time by submitting one on your behalf.​ Finding a recruiter willing to work with you is typically the issue. Most people give up after the first NO response from a recruiter, but there have been many successful waivers passed because a recruiter was willing to work with a candidate who was mature, respectful, and persistent with a never give up attitude. These characteristics can go a long way to getting a recruiter to work on your behalf up the chain of command. The Army has the reputation of approving the most moral waivers. The Air Force and Coast Guard approve the fewest. The Navy and Marine Corps fall somewhere in between. However, that's not always the case. 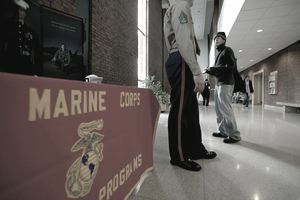 There have been times, during extremely good recruiting periods, where the Army won't consider any applicant who needs a moral waiver, at all.​ During times of downsizing of the military, not being at war, and when the civilian economy slow, the need of fewer recruits meets receiving more applications - this is the formula for fewer waivers getting approved. However, the opposite situation will improve the chances of waiver approval. Adult felonies. The services almost never (I'm tempted to say never) consider waivers for felony convictions that happened as an adult. Domestic violence that falls under the Lautenberg Amendment. The 1996 Lautenberg Amendment to the Gun Control Act of 1968 makes it unlawful for anyone who has been convicted of a misdemeanor of domestic violence to possess firearms. If you can't carry a firearm, you're not worth very much to the military. The waiver process is very subjective. More serious offenses require a higher level of approval in the recruiting chain-of-command than less serious offenses. However, regardless, a human being (usually a commanding officer) is going to make the final decision, and humans are usually more subjective than they are objective. For example, let's say your offense was burglary, and the final approval authority -- some colonel --had his house robbed. Do you think he's going to look kindly on a burglary waiver? If your waiver is disapproved, there is no appeal process. Several people have asked me about writing their congressman or senator, and you can certainly do so. But, in my opinion, it's a waste of time when it comes to disapproval of waivers. Congressional inquiries can be beneficial if the military does something wrong (against the law or against regulations), but the military does not have to approve (or even consider) your waiver. If your congress-critter does make an inquiry, the military is simply going to say, "we looked into it, and decided not to approve/consider the waiver," and that will be the end of it.